Sweet Freedom: Do You Know About Shrinkage? Do You Know About Shrinkage? I know I have already posted about raisins...more than once...but I am obsessed with them. I make them in huge batches every time grapes go on sale...but they're so delicious, I end up eating them all in the same day they finish dehydrating. Since they have become part of my regular diet, and I already eat so much fruit [fiber], I decided I better find out the grape/raisin weight ratio...to keep my grape consumption in balance and give myself a reality check—just because it's half the size, doesn't make it half the fruit. The Process: I weighed my grapes pre-dehydration, abstained from eating a single one while they dehydrated (so difficult), then weighed the mass of raisins post-dehydration. The Results: In an attempt at good scientific form, I repeated this experiment twice. Both times my results were close enough that I think I can draw a conclusion—shrinkage is about 80%. I realize there are many variables that could be considered, but...this was good enough for me. I just thought this was worth sharing, in case someone else was wondering the same thing...or has come up with a different answer? Hmm interesting… this is good to know because I always eat so many raisins and then remember later that the equivalent in grapes must be humongous. 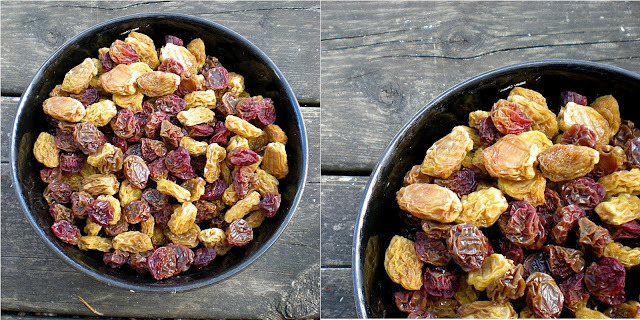 Dried fruit is a fickle snack! Also I laughed at the Seinfeld reference. Kale Chips: Am I Missing Something?